This is one of the hardest polishes to photograph. Any blogger will tell you that. I went to Ulta the other week with a few polishes in mind. I have about 5 on my “get list” right now. My “Get List” is basically a list of polishes that I want to see in person but aren’t exactly lemmings or must haves for me. I have a few from the Essie summer collection and I wanted to see if I couldn’t get my hands on Butter London’s “Lillibet’s Jubilee”. Only one of the polishes on my “get list” was in the store, and that happened to be China Glaze “Ride the Waves.” So I was looking through the rest of the polishes and this caught my attention and I was so shocked that I was drawn it to because I had never been drawn to it before. 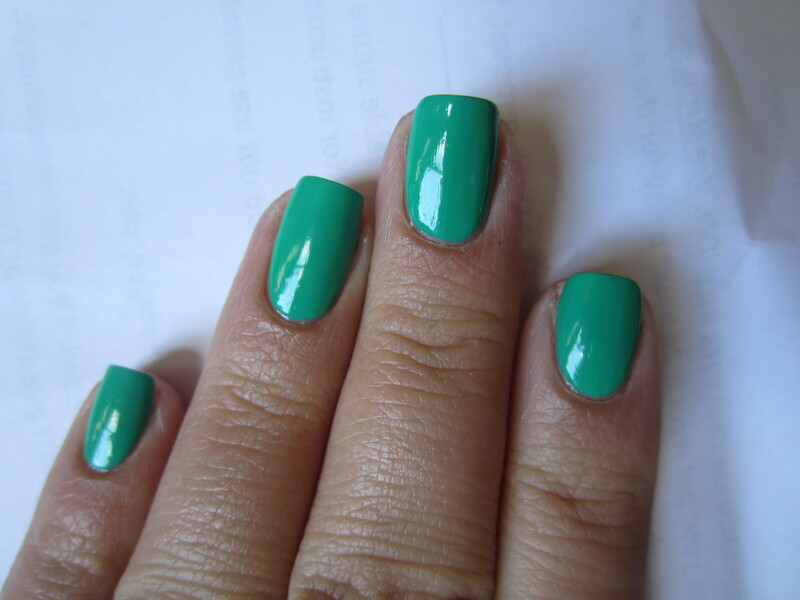 China Glaze “Four Leaf Clover” is a super bright, almost neon, medium toned green creme. I had never wanted this color before and couldn’t understand why so many people raved about it. I really wish I could have captured the true beauty and brightness of this polish but every camera hates it. Every picture turned out muted and it lost its almost glow in the dark quality. Plus the polish in every picture turned out more green than it is in real life. In real life, it leans almost a little blue. The formula on this polish was great! Four Leaf Clover came out in the China Glaze Up and Away collection that was released in Spring 2010. I have a few other colors from that collection and I have to say this formula was the best. While it was a little on the thick side, it was almost opaque in 1 coat. This is 2 coats in the pictures and I absolutely love how glossy the finish is. The wear time was also pretty nice too. I went for a 15 mile bike ride while wearing this polish, and while a bike riding isn’t exactly an activity that requires a ton of use of your nails, I didn’t get any chipping. I wore it for 3 days and only took it off because I needed a change of pace and everyone kept commenting on how bright it was. This is the perfect summer color and I seriously can’t wait to wear it again. But unfortunately, I’ve been doing a little nail polish shopping and have bought a few (well more than a few) new polishes. So I’m hoping I can squeeze this beauty in again in the new few weeks. What do you guys think? Do any of you have this polish? ooo this is so pretty!! This is such a gorgeous colour and you wear it well!